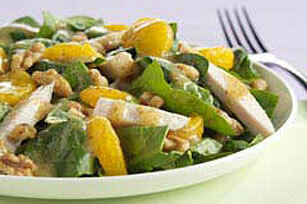 Tender turkey strips turn a salad of fresh spinach, mandarin oranges, walnuts and honey-mustard dressing into a satisfying main dish. Beat oil, mustard, honey and lemon juice with wire whisk until well blended. Layer spinach, turkey and oranges in serving bowl. Add mustard mixture and walnuts to salad; toss to coat. Serve this main-dish salad with a whole wheat roll for a well-balanced meal. Preheat oven to 350°F. Spread nuts in single layer on baking sheet. Bake 5 to 7 minutes or until lightly toasted, stirring after 4 minutes. Mix dressing as directed; cover and refrigerate until ready to use. Toss with remaining salad ingredients just before serving.